According to an Indianapolis Star report from earlier this month, June of 2015 was the wettest June in the history of the state. Average rainfall for the month state-wide was 9.03 inches, and it wasn’t only the wettest June we’ve ever seen; it was also our fourth-wettest month ever since record keeping began in 1895. Now we’re nearly halfway through July, but the turn of the calendar hasn’t done much to slow down the wet weather. Over the last few days, severe thunderstorms have brought with them high-speed wind gusts, hail, tornado warnings and, unfortunately, flash flooding. It hardly seems that a day goes by without the threat of a thunderstorm in the forecast so it is unclear when relief from the threat of flooding is on the way. That means there are important questions you need to ask yourself, especially if you are a pet owner. What is your evacuation plan in the event of a flood? 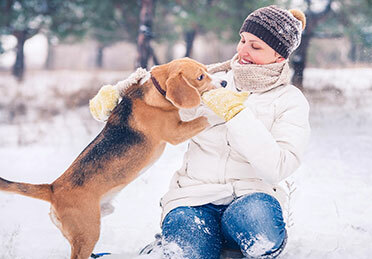 Does your plan include steps to ensure your pets’ safety? Now, no one is expecting you to make like Noah, build an ark and float away on the rising waters with your animals to safety. But there are some fairly simple steps to take to develop, or refine, a good flood plan for you and your pets. When it comes to getting your pets safely out of a flooded house, first thing is first; have suitable carriers available. While adults may be able to walk through knee-deep flood waters, that level is too high for pets to safely wade through. Rushing waters could overwhelm them or they could be struck by debris in the water. You do not want to be forced to leave your pets behind in a flooded home because you don’t have a safe way to get them through flood waters outside of the house. There are a multitude of crates and carriers available for cats and small dogs. Make sure you have enough on hand to account for all of your animals. Medium to large breed dogs should be placed in a suitably-sized crate or kennel to be carried out of the home. This is could be a two-person job depending on the size and weight of the dog. If you are forced to evacuate your home due to a flood, there is often uncertainty as to when you will be able to get back in. Because of this, having a pet emergency kit prepared will go a long way to making the situation more manageable. At a minimum your pet emergency kit should include a bowl, food, drinkable water and any medications your dog or cat currently takes. Other items worth considering are a leash, bandages, simple saline and a blanket. In the event that you and your pets are separated in the process of, or after, evacuating your house, updated registration information is crucial. If your pets are microchipped, go online and make sure that the information is up-to-date with your current address, cell phone number and email address. Also keep a tag on your dog’s or cat’s collar with the same current contact information, along with the pet’s name. A little research in advance of an emergency situation will also go a long way. Call around to, or email, shelters and/or rescue groups in your area to find out if they offer services in the event of an emergency. Additionally, you should ask your primary veterinarian about emergency window stickers. These stickers indicate to first responders (fire fighters, police, EMTs) that there are animals inside a residence, along with how many there are. Finally, know where the closest 24-hour emergency veterinary hospital is. Our hospital is always open to help with your pet emergencies. At the end of the day, no one wants to deal with the stress and the worry of a flooded home. More than that, though, no one wants the added stress and worry if something were to happen to their dog or cat in a flood. Consider some of these tips to help develop a flood-preparedness plan and talk to your veterinarian about what else can be done. And let’s all do some kind of anti-rain dance so that we can see the sun around Indianapolis for at least a few days.